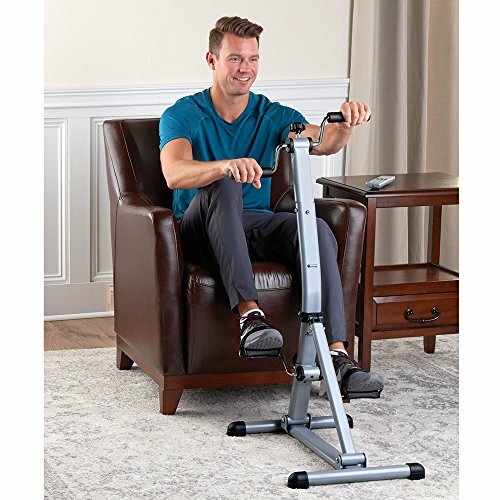 Only available from Hammacher Schlemmer, this is the low-impact exercise machine that provides a complete cardio workout from the comfort of a favorite chair. The pedaler combines a bike-simulating workout for the legs with an upper-body ergometer, letting users maintain overall cardiovascular fitness and muscle tone without strain on weight-bearing joints. This pedaler also tones hamstrings, quadriceps, biceps, and triceps with an optimal level of exertion. The pedals and arm crank can be cycled in reverse to work muscle groups with variations not possible with forward-only motion. The tubular steel frame has separate resistance controls for the foot pedals and hand cranks and a quick-release reach adjustment. If you have any questions about this product by Hammacher Schlemmer, contact us by completing and submitting the form below. If you are looking for a specif part number, please include it with your message.